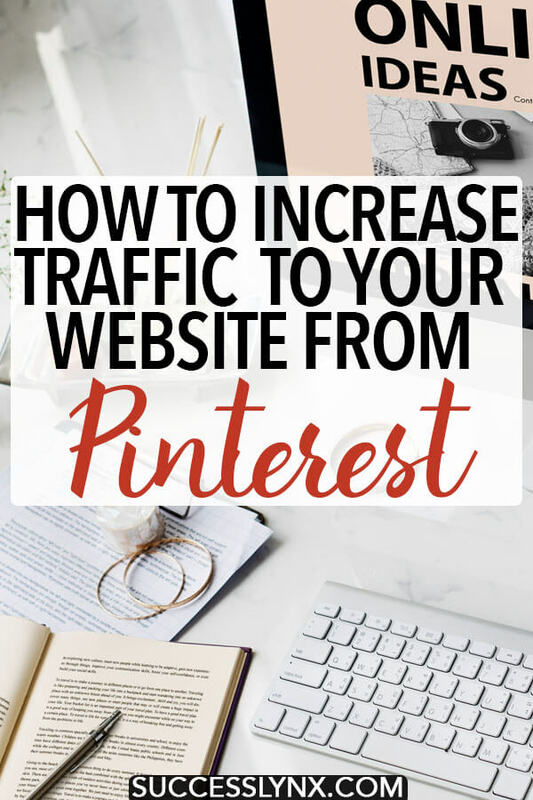 Let’s start simply: There’s a lot of traffic that you can get from Pinterest depending on your website’s niche. If you write about hobbies, lifestyle, travel, fitness, and health, you should have a Pinterest account. This post will walk you through how to understand your Pinterest Analytics, Pinterest strategy for 2019, and what to do about your pins when you’re not seeing traffic. Let’s do this. In the recent year, Pinterest has allowed us to more effectively gauge what is working by giving us more data to work with. As a self-professed data geek, I’m thrilled about this. A lot of people love to obsess over their number of viewers monthly. Personally, I couldn’t give a damn about the 1.3 million monthly viewers to my Pinterest account. It’s a vanity metric. Not all of them will click over to my website, but enough of them click that I make an effort to create beautiful and easy-to-read pins for most of my posts. The idea here is that we’re trying to figure out IF our pins have the potential to go viral or if we should go back to the drawing board. Don’t feel bad as not every pin will go viral, but sometimes it’s something as simple as the choice of image or font. Let’s be clear: monthly viewers are people who see pins from your website. It’s cool being in the millionaires club, but just like your follower count, it means nothing if nobody goes to your website. Sorry for being a buzzkill, but a good viral pin can bring thousands of sessions from Pinterest to your website daily. Pinterest has been changing the rules, however, I always recommend creating a pin, even for the most obscure posts. You have no idea when someone is searching on Pinterest for something and stumbles across your pin. Similarly, sometimes the strangest posts take off on Pinterest while others won’t. I like to vary up my pins. I strongly recommend not copying others’ pins, even if they’re successful. I don’t prescribe to the idea that your pins must have clear branding, however, a lot of fellow bloggers and business owners don’t appreciate it when you copy their pins. You can use Canva if you’re wondering how to get started with creating pins, but I use Photoshop myself. I always put my website name on any text pins as people will steal your viral pins to misdirect them to their website. Pin theft on Pinterest is rampent. If you’re putting yourself on a pin, I strongly recommend adding your website name to it as it makes me really uncomfortable to see a fake pin floating around with my face on it. If you make more than one pin, you can do A/B testing on your pins, which will allow you to see which pin is the most effective for bringing in traffic. I’ve honed my instincts, but I’m often wrong. I like to vary up the wording, fonts, and images. Don’t assume that you know best. By default, most images will not have a description. You’ll want to describe what is in the image using alt text, which is an SEO-friendly practice. Similarly, you should be adding text relevant to Pinterest on your main pins. 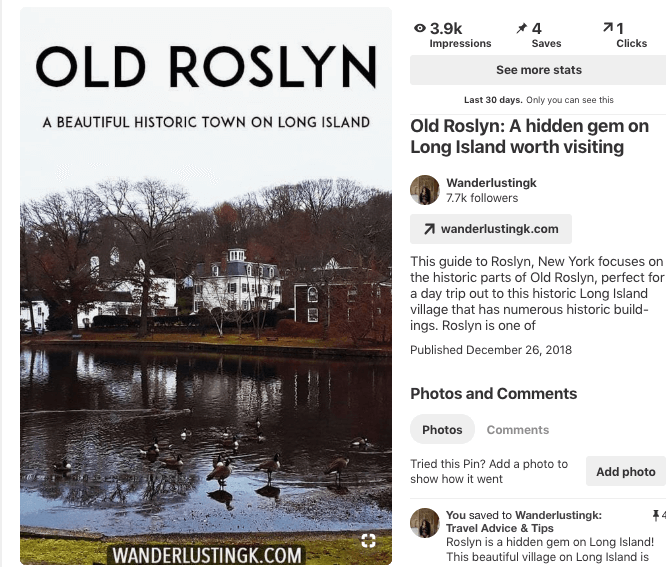 This is so simple, but beyond you (and fellow bloggers), normal people use Pinterest to save things that might be helpful/inspiring for their trip planning, goals, and hobbies. I give a recommendation for a fast sharing toolbar that won’t slow down your website here. In general, you don’t need a flashy toolbar and I don’t recommend forcing people to pin specific pins as people find different things inspiring. Simply, it just needs to be easy to pin. As soon as you’re done with your pins, pin them to your main board. I usually recommend having one or two boards featuring your best pins. It’s easier to keep an eye on your pins if you can see them! This is an important note as Pinterest is a visual search engine. I usually pin my nicest images as well as my randomest images! People love pretty images on Pinterest and they’ll click through in some cases. This is an important note as I’ve had posts that were very similar to other posts of mine, however when I made a pin that was visually similar to a viral pin, one didn’t work as well. Don’t be afraid to vary it up to see what happens. This is the big moment where your pin will nail it or fail it. Just like the perfect bread (or bagel), it takes times to rise (or fall). While I’m baking my bagels at home, I like to do some other things in the interim and I recommend taking a breather to work on other new content. If your business or blog has a business accountant, I strongly recommend checking the Pinterest Analytics -> Profile tab. This allows me to see what kinds of pins are doing best. Sometimes, I can seee others’ pins that my audience loves, which is helpful for helping me understand their interests. The people you reach tab can be helpful for figuring out your audience’s geographic preferences and language locations. Not surprisingly, I have quite a few Dutchies following me, but I really like the Interest tab within here. From here, you can see boards where your content is pinned. It allows me to understand what people are doing with my pins. It’s subtle, but rather than writing for a vague idea of an reader, it allows me to better tweak my future content to a real non-blogger audience. One of the hardest things is to figure out what is your default reach on an “average” pins. After three days, I recommend checking back on your pins. Some pins do really well with being repinned, however nobody clicks on the pin. You can see this pin here. Remember that it’s only been a few days, so the stats will be smaller and it is based on your organic reach on Pinterest. I like to have about 1,000 views on a pin to judge it effectively to determine if it’s a good pin. In the case of the one above, I saw four pins within a few days, but nobody was clicking through. To be honest, some pins can be slow growers as they’re about niche topics. Once someone in your niche finds it, it might take off later, but the Pinterest algorithm is getting harder. Pin: Thank you for your service. Next. My favorite kind of pins that have viral potential are ones that people save and click. A recent pin of mine took off like wildfire within two days. I prefer something closer to 1:1 in terms of saves to clicks ratio (e.g. 70 saves to 70 clicks), however, I’ll happily take the lopsided case where a pin has 70 saves with 120 clicks. Imagine how many clicks each repin by others brings to my website if a single pin does this well. Skip down if you’re not seeing awesome results. 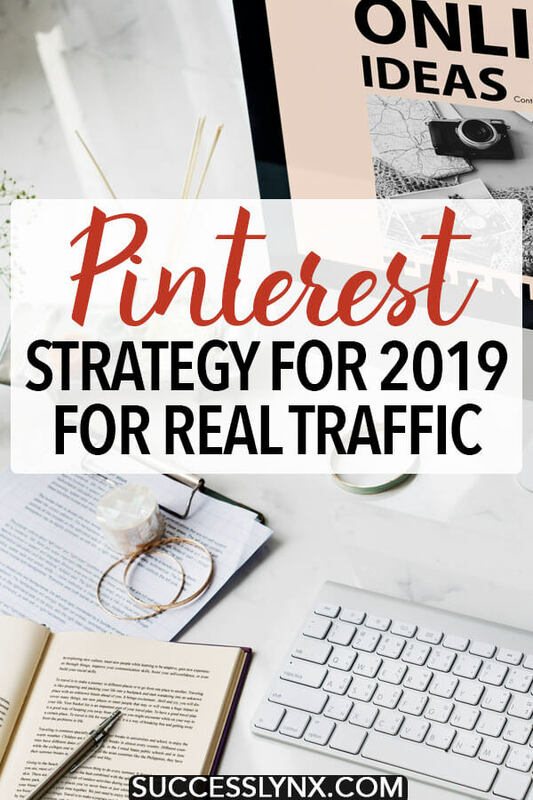 As of 2019, Pinterest is cutting down on repin threads and other popular strategies for repins… Use this information to help guide which pins that you should be sharing. A good viral pin will get repins on its own, especailly if you routinely share “good” high-quality content within your niche. It’s much easier to implement this strategy if you have a medium to large Pinterest account as it can be harder to judge if you don’t even have 500 views on a pin within a few days. If you think that it has potential, I recommend sharing it to a niche group board. Be careful with utilizing too many group boards as Pinterest is cutting down on them, but it’ s a good way to boost your reach. From here, you should see results. Avoid sharing the same pins too often to the same boards as Pinterest (as of January 2019) has said that sharing the same pins to the same boards can get you flagged as a spammer. However, a small variation on the previous pin might be enough to bring a lot of traffic to your website once you know what works. Do a happy dance and let your traffic pour in. One of Pinterest’s new demands upon its merchants and content creators is that we don’t repin the same pin too often. Consider making a new pin for the post after a few weeks once the traffic drops off–or that same week if your pin doesn’t take off. Instead of pouring time and effort into promoting pins that just aren’t effective for your business or blog, I advocate trying out new pins and different pin styles to see what works for your business or blog post. New traffic might be just around the corner, so don’t get stuck in your old ways. Sometimes, something as subtle as the pin font can make a huge difference as a feminine pin isn’t for everyone. Have you tried this viral pin strategy out? Let me know what you thought!